Alternative green food processing technologies have gained much technical and industrial attention in recent years as a potential means of reducing costs and promoting consumer awareness of corporate environmental responsibility. However, utilizing green principles is now becoming an effective business approach to enhance vegetable oil processing profitability. 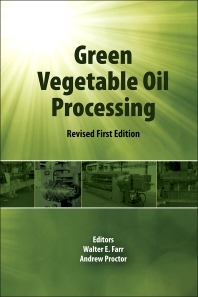 Two years have passed since the first edition of Green Vegetable Oil Processing was published. The Revised First Edition includes much of the content of the first edition, but incorporates updated data, details, images, figures, and captions. This book addresses alternative green technologies at various stages of oilseed and vegetable oil processing. This includes oil extraction technologies such as expeller, aqueous and supercritical methods, and green modifications of conventional unit operations such as degumming, refining, bleaching, hydrogenation, winterizing/dewaxing, fractionation, and deodorization. While most chapters describe soy oil processing, the techniques described equally applicable to oils and fats in general. Walter E. Farr graduated from Mississippi State University in 1960, with a B.S. in Chemistry, Minor in Chemical Engineering. He performed graduate work at UT Medical Center, Memphis, specializing in industrial statistics. He joined Southern Cotton Oil Company, Wesson Oil and Snowdrift Division (later to become Hunt Wesson Foods) in 1960 as a quality control chemist, where he designed and set up the first statistical process control system. He transferred to the Wesson Oil Refinery in Fullerton CA, where he spent four more years as the refinery superintendent. This was followed by a tour of duty with ADM, Decatur IL; Anderson, Clayton & Co., Houston TX; and Kraft Foods, Memphis TN. He was named Kraft Technology Fellow in 1992, and retired from Kraft in 1993. He then spent 5 years with Owensboro Grain Co., Owensboro KY, and 5 years with Desmet NA, Atlanta, GA. Retiring again, he formed The Farr Group of Companies in Memphis, TN, in 2003. He joined the American Oil Chemists’ Society in 1973, where he was and he has been co-editor of several books, and chapter author in many more. Farr was named Fellow, AOCS in 2007. Andrew Proctor, of the University of Arkansas in Fayetteville, was recognized as a leading professor of lipid chemistry and food science, with a focus on lipid analysis, conjugated linoleic acid, and rice oil co-products. He has distinguished himself as a researcher with more than 100 publications to his credit. He was also instrumental in establishing an ex­-change program between the European Union (E.U.) and United States (U.S.) on renewable resources and clean technology. The program provides grants for international curriculum development and related student exchange. Proctor has served on close to 30 different AOCS committees or boards, including the Books and Special Publications Committee (2000-2002) and the Governing Board, as a member-at-large (2007-present). He served as chairperson of the Analytical Division Program Committee from 2005-2007 and has been an associate editor or senior associate editor of JAOCS since 1992. In 2008, he organized and chaired the Professional Educators’ Common Interest Group-a group that seeks to provide tools for the teaching of fats, oils, and lipid chemistry. Proctor received the AOCS Herbert J. Dutton Award in 2010 and has been a Fellow of the UK’s Royal Society of Chemistry since 2006.